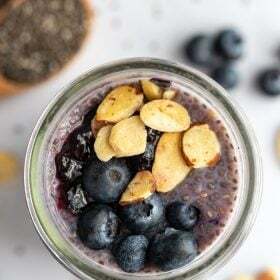 Learn how to make this DELICIOUS Chia Seed Pudding with 4 different flavor options! Flavoring of 1/4 cup of mashed fruit, 1-2 tablespoons cocoa powder, OR a splash of vanilla + 1 teaspoon of cinnamon. Add mix-ins to the bottom of a resealable container. If using fruit, mash it thoroughly before adding in other ingredients. Add in milk, chia seeds, and maple syrup. Shake/ stir until all of the ingredients are well combined. Place in fridge for at least 4 hours or overnight (I typically make these the night before). ENJOY! :) I like adding a bit of fresh fruit on top or even a few nuts for a nice crunch.